In today’s environment, you’ve got multiple options for wearable devices that help you achieve your health and fitness goals. Some are designed for running and cycling while others are designed for counting steps and monitoring sleep. Some claim to cover both. Making the right choice can be difficult. 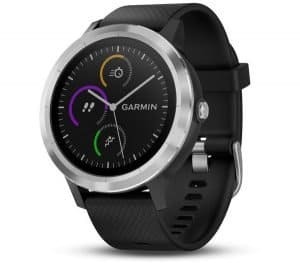 That’s why we have gone ahead and narrowed down the top 3 Garmin fitness watches with GPS to help you in your search for the perfect wearable. 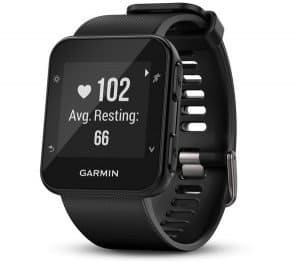 Garmin is a top brand name in the wearables and GPS spaces which means you can trust that you are getting quality and value in one package. Best of all, their fitness watches combine style, comfort, and usability into one sleek package. With Garmin watches you won’t feel like you have to have different wearables for work and at the gym. Whether you are running or want an activity tracker to count steps, the style and functionality work no matter what you’re doing. And they all come with decent battery life with a rechargeable lithium-ion battery! Ready to jump in and take a closer look at these top 3 Garmin fitness watches? Let’s go! The Vivoactive 3 is a fitness watch that actually looks like a watch and offers all of the functionality of a top-quality smartwatch. 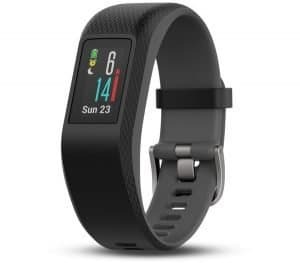 With all of the fitness tracking features you expect from a Garmin product, the Vivoactive 3 is the ultimate choice for someone who wants style and function. The full color, touchscreen display is vibrant and intuitive. Whether you’re at the gym or sitting in the boardroom, the Vivoactive 3 gives you seamless access to whatever you need. Monitor notifications, track your workout and do everything in between. One very interesting feature of the Vivoactive 3 is Garmin Pay which allows you to use your watch to pay for purchases. Link your compatible credit or debit card, tap your watch on the payment terminal, and go! No need to carry around your phone, wallet, or cash if you don’t want to. This is especially handy at the gym when you don’t need extra items weighing you down. For those worried about style, the Viviactive 3 has you covered. The watch faces are customizable with hundreds of options to suit your mood. Plus, you can easily change the watch bands for a color that shows off your personality and style. Finally, of course, any good wearable is not complete without a solid smartphone app behind it. The Garmin Connect Mobile app puts a ton of power right at your fingertips. Check on your workout stats, share with friends or family, and stay in touch with your workout partners as you challenge each other to achieve new personal bests. The Garmin Forerunner 35 packs in all of the fitness features you could ever want in a smartwatch. However, the lower price tag does mean that it lacks some of the additional bells and whistles you will find on the Vivoactive 3. Let’s take a closer look to compare the two. First up, is the look and style. The Forerunner 35 sports a square watch face which might remind some people of the Apple Watch. Style is subjective but the Forerunner 35 can easily fit into your life whether you’re at the gym or at the office. If you want a more classic watch style then this might not be for you but, make no mistake, this is a very nice looking smartwatch. You won’t get some of the extra features like a full-color display and Garmin Pay in the Forerunner 35 but you still have access to all of the fitness tracking features that Garmin is known for. A built-in heart rate monitor makes tracking your workout easier than ever without the need for any additional accessories like chest straps. Use the GPS functionality to track your run including distance traveled and speed. One very nice feature of the Forerunner 35 is the ability for the device to easily understand your movements and workouts without any input required. Some other fitness trackers require you to start and stop your workout for accurate tracking. With the Forerunner 35, you simply start working out and your watch will do the tracking automatically. Best of all, you still get some essential comfort features in the Forerunner 35 which makes it an ideal fitness watch for all aspects of your life. Monitor notifications right on your smartwatch and use the Garmin Connect Mobile app for deeper access to your workout stats as well as social features. If some of the additional features of the Vivoactive 3 don’t interest you then the Forerunner 35 fitness watch is a great solution. You get all of the fitness tracking power in a sleek wearable with a smaller price tag. Finally, on our list of top Garmin fitness watches, it’s the Garmin Vivosport. This fitness watch is styled more like a traditional fitness tracker rather than a watch. For some, this may be more appealing than wearing a full watch. If you are simply looking for a great fitness tracker with some extra features then this is the product for you. With built-in GPS, heart rate monitoring, and stress tracking, the Vivosport packs a ton of features into a sleek, small package. Track your activity all day long, no matter what you’re doing with the Vivosport and Garmin Connect Mobile app. Of course, the Vivosport isn’t simply for fitness tracking. Check text messages and control your music with the chroma display right on your wrist. Don’t let the small, sleek design fool you, the Vivosport boasts a lot of features at a very attractive price. For those who want to get away from the styling of a traditional watch and like the fitness tracker look of the Vivosport; it would be very hard to find a better product with more features at this price point. No matter what Garmin fitness watch you choose, you will be happy with your purchase. Now, what are you waiting for? Get out there and get moving!